Return to homepage Huanhuan Chen. "Big Data with Knowledge Engineering", National Key Research and Development Program. PI in USTC, 8.55 Million RMB. (Total 45M with 5 PIs in different universities), 2016. "Evolutionary Path Analysis with Learning in the Model Space", National Natural Science National Natural Science Foundation of China (NSFC), PI, 200K RMB, 2016. 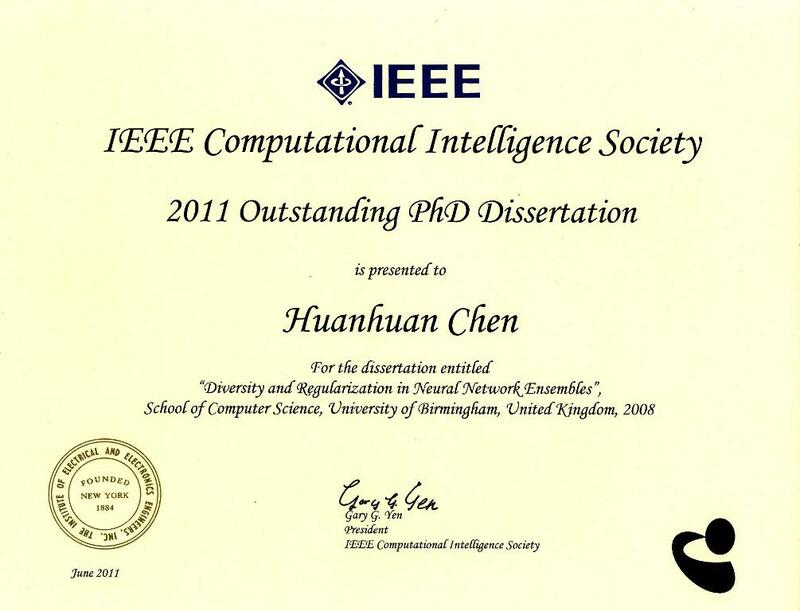 "Learning in the Generative Model Space with Application to Computational Biology", International Joint Project between Royal Society and the National Natural Science National Natural Science Foundation of China, PI in USTC, 120K RMB, collaborated with Dr. Shan He in University of Birmingham, 2015-2017. 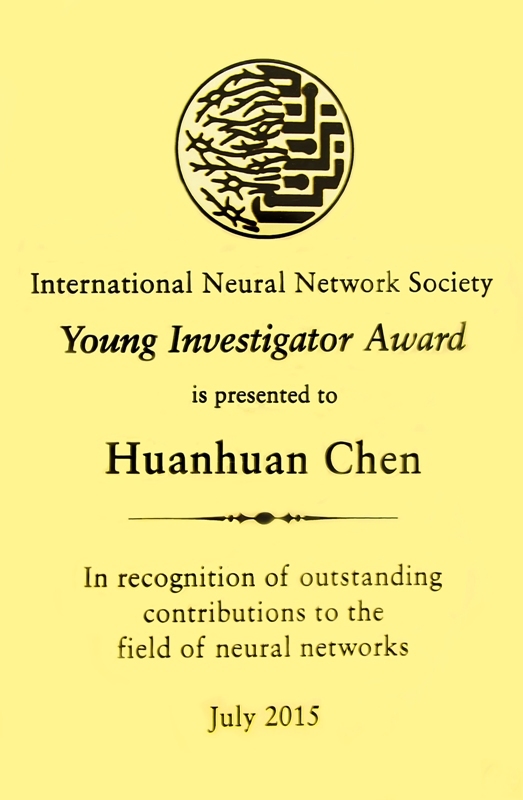 "A Novel Cognitive Fault Diagnosis Framework", International Exchanges Scheme between Royal Society and the National Natural Science National Natural Science Foundation of China (NSFC), PI in USTC, 120K RMB, collaborated with Prof. Anthony G. Cohn in University of Leeds, 2013-2015. 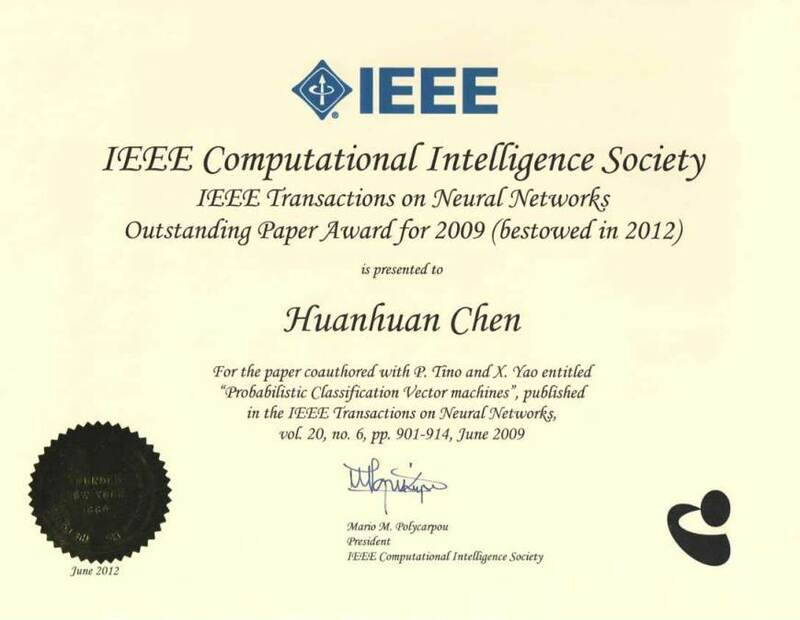 "Imbalanced Learning by Semi-supervised Learning", NSFC, 240K RMB, PI, 2012-2015. 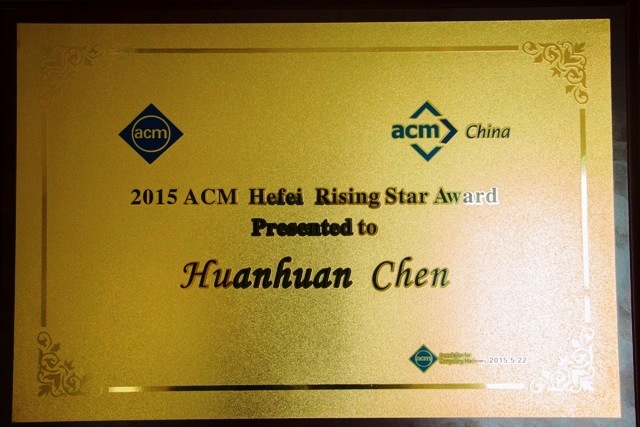 "Machine Learning and Reasoning", Young Thousand Talent Program. Organization Department of the CPC Central Committee, PI, 3 Million RMB, 2012-2016. Dynamic Systems and Learning in the Model Space. The International Joint Conference on Neural Networks 2015(IJCNN),Killarney,Ireland,July 2015. Ensemble Learning through Diversity Management: Theory, Algorithms, and Applications. The 2011 International Joint Conference on Neural Networks, San Jose, California, July 2011. Bridging Machine Learning and Evolutionary Computation. The 2015 IEEE Congress on Evolutionary Computation (IEEE CEC), Sendai, Japan, May 2015. Data Regularisation, Fault and Anomaly Detection, Isolation and Mitigation. The 2012 IEEE World Congress on Computational Intelligence, Brisbane, Australia, June 2012.